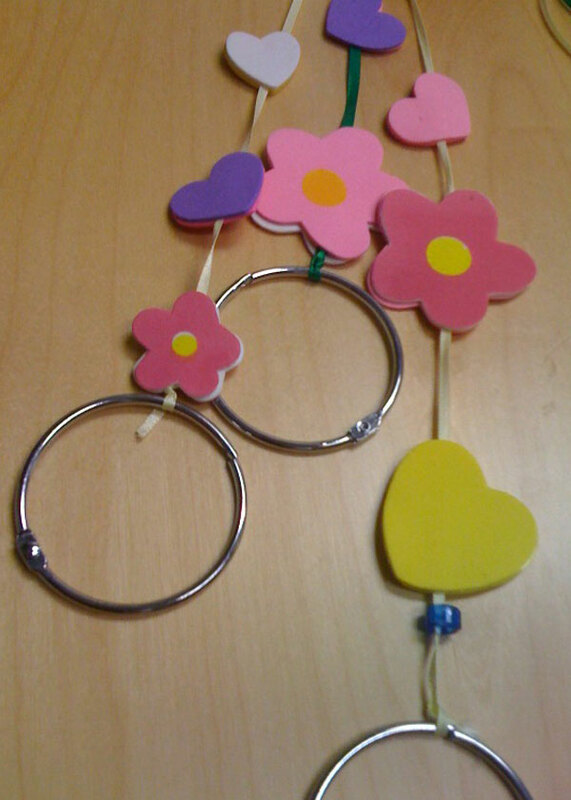 While these are the items we used for our wind chime, you can absolutely make substitutions depending on what you have on hand. For example, if you don’t have book rings, try using old keys or other metal items. Just make sure that the noise you’ll hear when they hit each other doesn’t make you cringe! 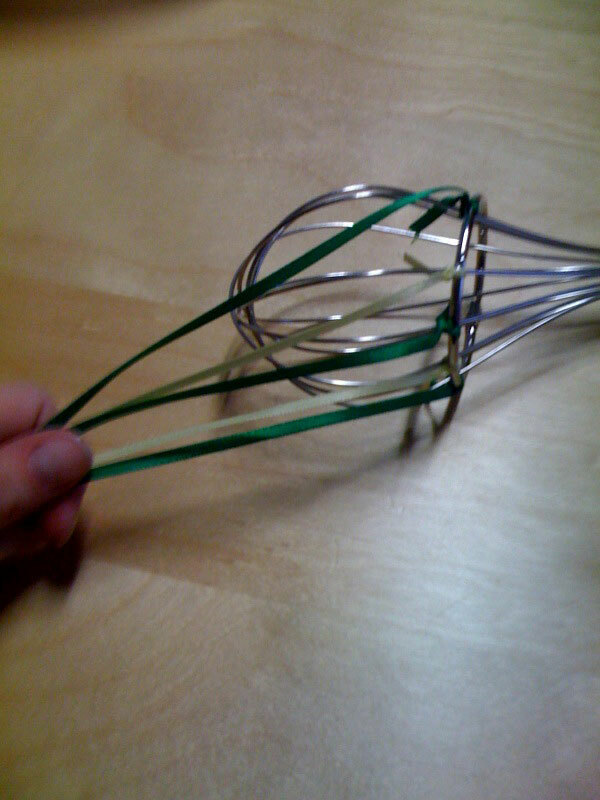 Slip one of your book rings over the skinny end of the whisk and pull it down as far as it will go over the wire arms. Cut 10-12 pieces of ribbon in varying lengths. Tie one piece of ribbon at each point where the ring crosses an arm of the whisk. We alternated our green and yellow ribbons! Using a double knot, tie a book ring at the bottom end of each ribbon. 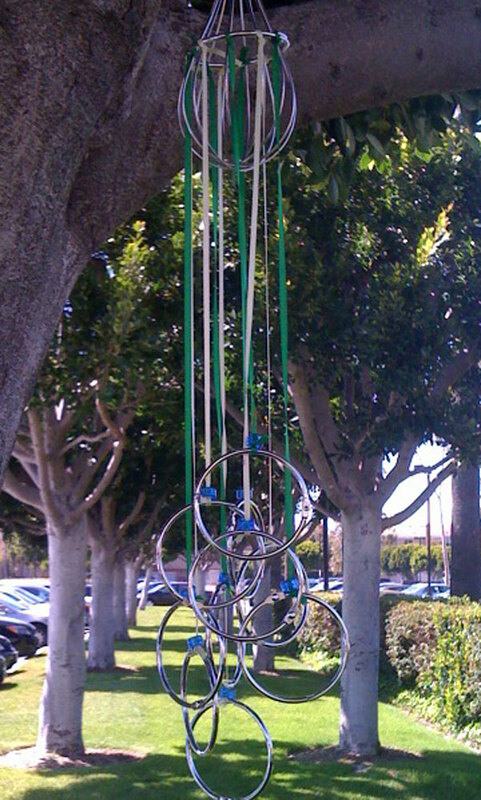 Make sure that the rings hang low enough to hit their neighbors – the wind chime will sound as the rings tap against each other in a breeze. For added decoration, slip 1-3 beads onto the ribbon before tying it onto the ring. Add whatever decorations you’d like! Hang your wind chime where it is sure to be caught in the breeze, then listen for the gentle tinkle of the book rings as the bump into their neighbors.